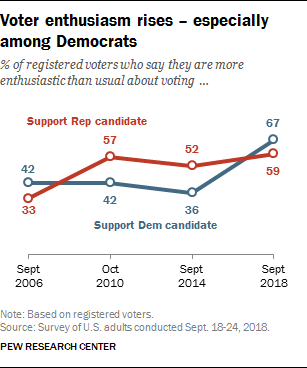 With less than six weeks to go before the elections for Congress, voter enthusiasm is at its highest level during any midterm in more than two decades. And a record share of registered voters – 72% – say the issue of which party controls Congress will be a factor in their vote. 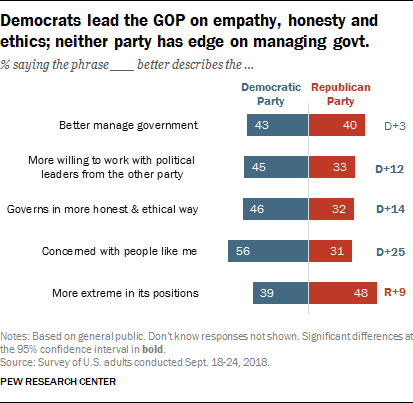 As in the past, neither party has an edge on better managing the government (43% say the Democratic Party, 40% the Republican Party). More people continue to regard the Republican than the Democratic Party as “more extreme in its positions” (48% Republican Party, 39% Democratic Party). In terms of issues, the Democratic Party continues to hold a wide advantage over the Republican Party on dealing with health care (51% to 35%) and modest leads on foreign policy and immigration. While the two parties run about even on dealing with the economy (41% Democratic Party, 40% Republican Party), that represents a change since June, when the GOP held a significant, 9-point edge on handling the economy. The survey, conducted amid allegations of sexual misconduct by Brett Kavanaugh, Trump’s nominee for the Supreme Court, finds that large majorities of voters in both parties view Supreme Court appointments as a “very important” voting issue. Overall, 76% of registered voters – including 81% who support the Democratic candidate and 72% who favor the Republican candidate – say appointments to the court will be very important to their vote this fall. Among all voters, Supreme Court appointments rank with health care (75%) and the economy (74%) among the top voting issues. While health care and the economy typically rank among the top issues for voters, there is no trend to past midterms on the importance of court appointments. However, more voters view Supreme Court appointments as a very important issue today than did so in June 2016, during the presidential election. At that time, 65% of voters (70% of Republicans and 62% of Democrats) said court appointments were very important. There are sizable partisan gaps over the importance of a number issues. As in the past, Democratic voters (82%) are far more likely than Republicans (38%) to say the environment will be very important. The gap is about as large over the importance of the treatment of racial and ethnic minorities and the treatment of gay, lesbian and transgender people. Democratic voters are about twice as likely as Republican voters to consider the treatment of racial and ethnic minorities as a very important voting issue (85% vs. 43%). 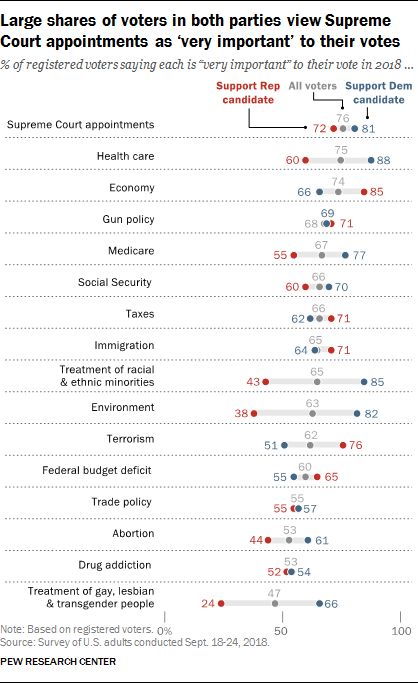 And while two-thirds of Democrats (66%) view the treatment of gay, lesbian and transgender people as very important, just 24% of Republicans do so – the lowest share of Republicans citing any of the 16 issues as very important. Democrats also are more likely than Republicans to view health care, Medicare and abortion as very important voting issues. More Republicans than Democrats rate the economy, terrorism, the federal budget deficit and taxes as very important. Comparable shares of voters in both parties rate several issues as very important. For example, 71% of voters who favor the Republican candidate in their district and 69% who support the Democrat say gun policy will be very important. There also are not significant partisan differences on the importance of drug addiction and trade policy. Voters remain concerned that no matter which party prevails in the midterms, they will not strike the right balance in overseeing the Trump administration. But unlike three months ago, more voters are concerned about what the GOP may fail to do if they retain control of Congress than what the Democrats might do if they gain control of Congress. Currently, 64% of voters say if the Republicans keep control of Congress, they are very or somewhat concerned that the GOP will not focus enough on oversight of the administration. A smaller majority (55%) expresses concern that if the Democrats take control of Congress, they will focus too much on investigating the Trump administration. In June, identical shares of voters (58% each) had concerns over both possible scenarios. These opinions remain deeply divided along partisan lines, but Democrats are increasingly likely to express a great deal of concern that, if Republicans prevail, they will fail to do enough oversight of the Trump administration. Three-quarters of Democratic voters say they are very concerned about this, up from 65% three months ago. 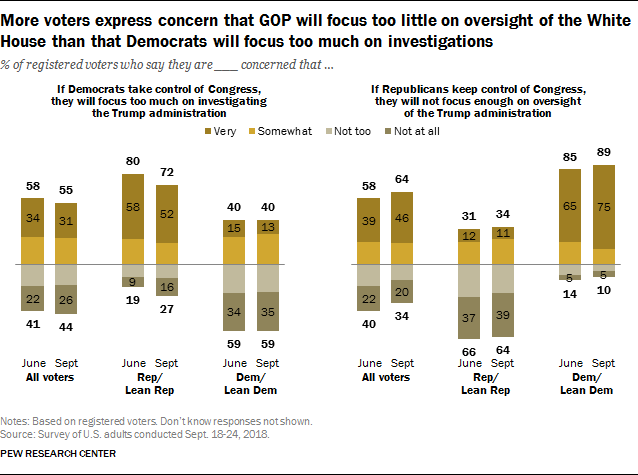 By contrast, only about half of Republican voters (52%) say they are very concerned that if Democrats win control of Congress, they will focus too much on investigating the Trump administration. That is lower than the share of Republican voters (58%) expressing a high level of concern over Democratic overreach in June.